Your media needs to be safely stored and protected. 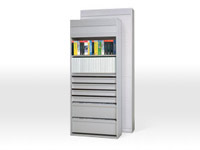 AES offers a comprehensive line of media cabinets just for this purpose. We can assist you with choosing the proper storage solution for your unique environment, and our design team can furnish you with a suggested layout. Please click on any offering below to learn more. 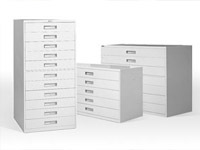 Cabinets come in a variety of shapes and sizes with either dedicated or adjustable drawer interiors. Drawer pulls are the classic recessed design with chrome frame. Latest contemporary design is optimized for easy access and high capacity. 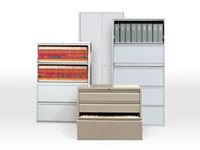 Adjustable drawer interiors with patented Slide-N-Lock wire dividers provide maximum flexibility and capacity. 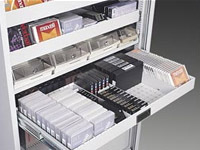 Adjustable and dedicated shelving designed specifically for all types of Audio / Video and Data Media formats. The shallow footprint fits well along walls and in narrow corridors. The integrated locking tambour door rolls up to expose the entire cabinet interior and neatly hides all when closed. 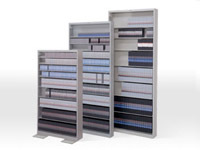 The highly flexible interior makes Slimcase a storage solution that fits in anywhere. The unique ALL STEEL bi-parting door glides with ease on our special aircraft cable track system. Features of Multi-Media Cabinets include, 1/2 inch increment adjustment for all components, heavy gauge steel construction, lock & keys and powder coat paint finish for durability and great looks. 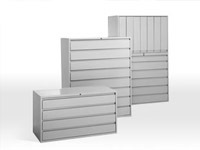 With multiple heights and widths to choose from, designed with slotted inner panels and a wide variety of drawer and accessory options you can specify these cabinets to meet your exact requirements.